Equinox Publishing (Indonesia), 9781845534578, 574pp. Chosen by Saveur magazine as one of the best ten cookbooks of 2013 Winner of the Gourmand World Cookbook Award for the UK in the Best Arab Cuisine Book category" Delights from the Garden of Eden] is truly a journey; you'll learn about table manners, dining protocol, how the etymology of Arabic food words can be traced back to their earlier roots, the culinary riches and ingenious recipes of medieval Iraqi cooks, and how ancient Mesopotamian customs can be traced to the present. It is a labor of love that illuminates the deep connections between food and culture, past and present, and above all, shows us how much we have in common. Highly recommended; this should be in every cookbook collection if you are interested in Middle Eastern cuisine If you already own the original first edition, it is WELL worth purchasing the updated and revised second edition." S. HODGE, Amazon.com, July 2013 "A culinary odyssey through 8,000 years of Mesopotamian culture and some of the world's oldest recipes, preserved on 3,700-year old cuneiform tablets." RALPH BLUMENTHAL, The New York Times Originally self-published in 2003, Delights from the Garden of Eden became an underground bestseller and award-winner. Now fully revised and updated, this new edition, luxuriously illustrated throughout with colour photos, paintings, medieval miniatures and sketches, displays the diversity of the region's traditional culinary practices, delicious and enduring. The book contains more than 400 recipes, all tested and easy to follow, and covers all food categories with ample choice for both vegetarians and meat lovers, and many that will satisfy a sweet tooth. Ingredients and cooking techniques indigenous to the region are fully explained. Unlike the majority of cookbooks, the book uniquely traces the genesis and development of the Iraqi cuisine over the centuries, starting with the ancient Mesopotamians, through medieval times and leading to the present, aided throughout by the author's intimate native knowledge of cookery. Of particular interest are the book's numerous food-related folkloric stories, reminiscences, anecdotes, songs, poems, excerpts from narratives written by foreign visitors to the region, and cultural explications of customs, all interwoven with the recipes. The book is supplemented with detailed menus and an extended glossary to familiarize the reader with the indigenous ingredients used in creating authentic Iraqi meals. The book is a valuable addition to the shelves of specialized and general libraries and a must-have for food lovers everywhere. More Reviews of the First Edition: "Humorous, insightful and a pleasure to read. 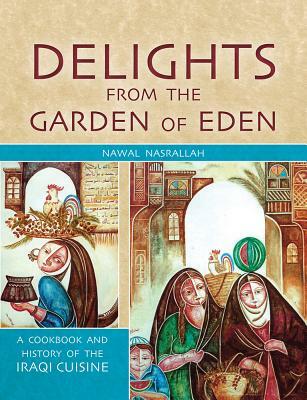 Nawal Nasrallah blends recipes, culinary history, folklore, personal stories and art in a lively mix. Her recipes are precise and easy to follow, with tips and observations derived from her long experience with Iraqi cuisine. Highly recommended." PAULA WOLFERT, author of the award-winning Cooking of the Eastern Mediterranean "This cookbook is more than an introduction to Iraqi cuisine. It is in fact an introduction to Arab cooking in general, researched with the kind of depth not seen before in a cookbook of the Arab world and Middle East. " CLIFFORD A. WRIGHT, winner of the James Beard/KitchenAid Cookbook of the Year and the James Beard Award for Best Writing on Food for A Mediterranean Feast "A monument to energy, knowledge and enthusiasm. It is an account of origins and development as well as of the complex ethnic make-up of present-day Iraq." TOM JAINE, Petits Propos Culinaires "A project of meticulous and thorough research. Not only Iraqis will be proud of Nawal's achievement in presenting information, known in the main only to specialized Assyriologists and anthropologists, in such an accessible and easy-to-read volume." MARGARET OBANK, Banipal "There are over 400 recipes, and the ones I have tried are wonderful. But although the recipes are in a way the main point of a cookbook, in another way they are here a mere vehicle for the stories, the food lore, the proverbs, the poetry, the word play and the sociological tidbits that Nasrallah has to share." CHRISTINE BARBOUR, Herald Times, Bloomington, Indiana. Nawal Nasrallah, a native of Iraq, is an award-winning researcher and food writer. Her English translation of Ibn Sayyar al-Warraq's tenth-century Baghdadi cookbook Kitab al-Tabikh, entitled Annals of the Caliphs' Kitchens was awarded "Best Translation" in the Gourmand World Cookbook Awards in 2007. Her recipes have featured in many magazines and newspapers, such as The New York Times, Boston Globe, and Food and Wine. Her most recent book is Dates: A Global History (Reaktion, 2011).